Determine total shim thickness "S tot." (Si + S2). The ring gear must be adjusted if the transmission case, side transmission cover, tapered-roller bearing for differential, differential housing or drive set have been replaced. 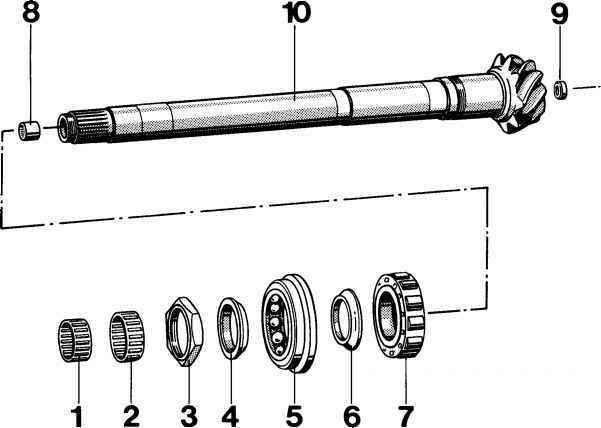 The drive pinion must be removed to determine the preload of tapered-roller bearing on the differential. 1. Make sure that the outer bearing races of the tapered roller bearings are well seated in the transmission case or side transmission cover. 2. Fit one spacer ring, 2.5 mm thick, on the ring gear side and opposite side of the differential to be used. 3. 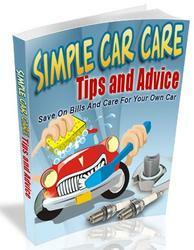 Insert differential into transmission case and crank several times. 5. Lay final dimension plate VW 385/17 on the collar of the differential. 6. Fasten universal dial-gauge holder VW 387 with dial gauge and extension to the case and set to 0 with 2 mm preload. 7. Move differential up and down. Read off backlash on the dial gauge and note. 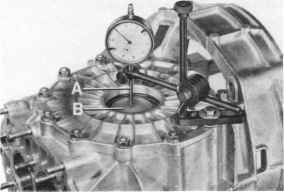 Do not turn differential while measuring backlash as this will falsify the measuring result. 9. Remove differential, pull off both tapered roller bearings and split calculated shim thickness "S tot.11 as follows. Select spacer Si 0.70 mm thinner and S2 0.7 mm thicker as a starting point for subsequent adjustment of the flank backlash. Measure shims with a micrometer in several places. Permissible deviation 0.02 mm. Also check shims for burrs and damage. Spacers are available in thickness 1.6...3.1 mm in increments of 0.10 mm. A 0.25 mm thick shim makes it possible to graduate shim thicknesses in increments of 0.05 mm. The calculated shim thicknesses must be rounded up or down for plausible dimensions, so that the total thickness Si and S2 does not alter.